‘Learning to Change’ provides a comprehensive overview of organizational change theories and practices developed by both U.S. and European change theorists. The authors compare and contrast different approaches: five fundamentally different ways of thinking about change : yellow print thinking, blue print thinking, red print thinking, green print thinking and white print thinking. They also discuss in detail the steps change agents take, such as diagnosis, change strategy, the intervention plan, and interventions. The book assists change agents to stay away from integral plans that lack focus. A good diagnosis helps identify underlying dynamics that enable or frustrate change. A carefully chosen change strategy (also in terms of the most viable ‘color’) creates leverage to address such dynamics most effectively. Many change efforts suffer by taking these two steps too lightly: a diagnosis then brings a myriad of issue to the fore and the intervention plans tries to deal with too many of them in a conflicting mixture of interventions. In addition, they explore the attributes of a successful change agent and provide advice for career and professional development. The book includes case studies that describe multiple ways of understanding and addressing organizational change issues. The book will appeal to both the practitioner and academic audiences. It can be used as a text in graduate courses in change management and will also be a useful reference for consultants and managers. 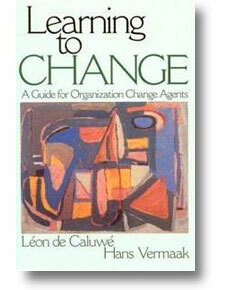 Learning to Change became a bestseller upon its initial publication in the Netherlands. The color-model on change is very popular among many thousands of managers and consultants and presents a new approach to change processes and a new language for change. A brief introduction in the color model is available through an article in de OD Journal or one of the video’s on the site.